More about Marimekko Socks Rolled Down Turquoise Tumblers - Set of 2 Whether for juice with the morning paper or an after dinner cocktail, these unique tumblers are sure to bring a smile to your face. 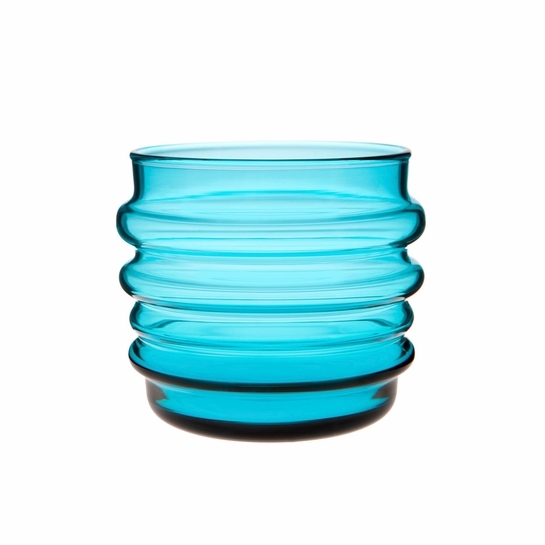 The lively 2010 design of Anu Penttinen’s “Socks Rolled Down” Turquoise Tumblers by Marimekko feature folds that effortlessly fit the fingers and are dishwasher safe. Each bold turquoise tumbler measures 3” x 3” and holds up to 8 oz. of your favorite beverage. 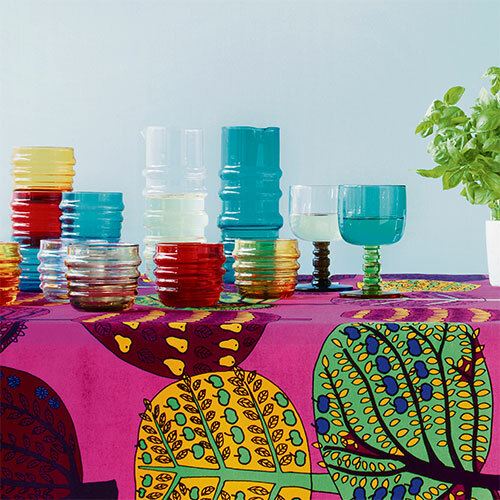 Note: This Marimekko glassware has been individually made by way of mouth-blown glass. 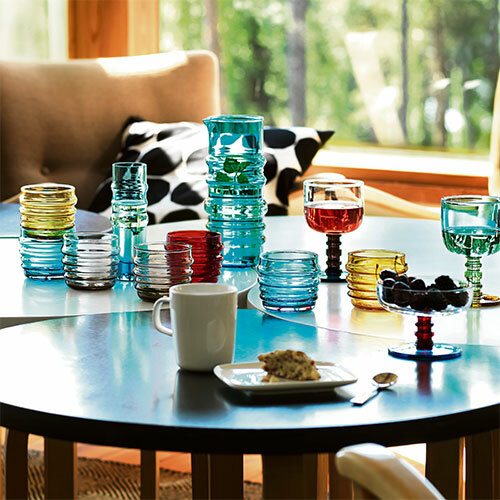 Small bubbles in the Marimekko glass indicate the nature of the handiwork and make your specific piece unique. These glasses have a petite presence on the table but they pop with color. They fit the hand better than any glass I've ever owned, and some were Waterford crystal, some Iittala! The kicker is they hold more liquid than you'd think. And the color! It glows. I love these. They are fun and easy to hold; perfect for people with smaller hands. Love, love, love! I just ordered another set. We now have amassed a total of six of these marimekko Socks Rolled Down glasses : two in red, two in gold and two now in turquoise. The excellent hand feel is, of course, the same in any color but the vibrancy of these new glasses pleases us no end. The ability to mix and match the glassware and pick a color based on mood is great fun. The sure handedness offered by the ridges in the "socks" ensures that they are chosen often for patio duty. The glasses are light weight and seem quite delicate but, after you've had them a while, you'll find what workhorses they are. We can't wait to see which vibrant color might be introduced next. Love these glasses! ProsGreat colors, excellent hand feel and General stability.